Construction has started and we are closing in on the capital campaign fundraising goal! Generous donors have offered a matching gift challenge of up to $100,000 to help to raise the final $200,000 between now and June 30, 2019. All new gifts to the capital campaign will be doubled in the Finishing Touch Challenge. You can sponsor trees or bird feeders, fans or lights, chairs or benches, or donate any amount in honor of someone special. Your gift puts the finishing touch on the $9.6 million capital campaign that will nearly double the size of Family House. Your gift to the Share the House Capital Campaign is fully tax-deductible as permitted by law. 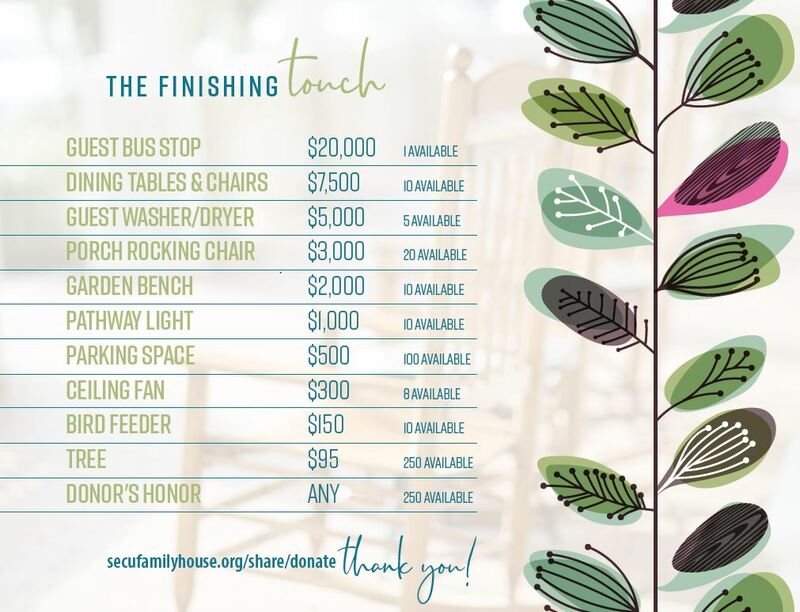 Donors will be recognized as “Finishing Touch” contributors in campaign donor listings after the campaign ends in July 2019. Create a fundraising page on everydayhero.com https://nfp.everydayhero.com/us/secu-family-house-at-unc-hospitals. Click on Start Fundraising and follow the instructions to create and distribute your fundraising page. Edit the fundraiser details to let people know you’re raising funds to put the Finishing Touch on the capital campaign to expand Family House. Thank you for giving patients and their families a safe, nurturing, and affordable place to stay while receving life-saving medical treatment at UNC Hospitals in Chapel Hill.